…until the FooL opened a door to a whole new reality. Betsey and Matt have escaped the cosmic frying pan and landed in a whole new fire when they crash land in an alternate reality where shapeshifters called changelings are a fighting a war the humans to determine who will rule over the world. Right now the humans are winning, which would be good news for Betsey—if she was still human. But before Betsey is can be of any use to anyone (including herself) she’s going to have to figure out how to shift out of her animal form! 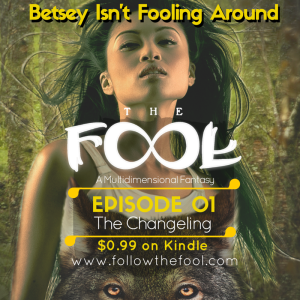 The Changeling is the first season of the The FooL: a new adult fantasy series that jumps between realities, keeping our heroes on their toes as they deal with magical spectacle, and adds healthy dash of paranormal romance and humor. The FooL is a portal into multidimensional paranormal fantasy adventure series that will also appeal to fans of romance, urban fantasy, and humor. Andrew Mayer is to the sci-fantasy genre what Grant Morrison is to comics: at once a mashup of the past and purposeful move onward. Get your dose of 21st Century multiverse right here, from an author who clearly loves playing in this space, and with your mind.